I took my clients (Jenny and Greg) in Armidale out for dinner on Wednesday night and as the evening progressed I told them about this blog. Jenny turned to Greg and said I should contact Lachie and see if he will show Brendan around. I had to ask who was Lachie and what did he do. I was told he ran "Fleet Helicopters" up at the airport and has a few really old awesome aircraft. I was getting quite excited as I had seen these aircraft from the fence but couldn't get any good descent photographs. The next morning Jenny rang Fleet Helicopters and told them my story, without hesitation Lachie said send him around. After meeting Lachie (Lachlan Onslow; Director / Chief Pilot) I was made to feel very welcome and Lachie took the time out of his busy day to show me around his workshops and hangers. After walking through the very busy workshop where I saw 3 helicopters being worked on we walked outside where I saw a North America AT-6G and was in ore of its condition. Up in the corner of the yard near the road was a big beautiful De Havilland DHC 2. I remember looking around thinking wow this is awesome, when Lachie took me over to a very large hanger and inside were a couple of Cessna 525's and a 441 among other things, then out of the corner of my eye I spotted Boeing Stearman E 75. But it seemed Lachie wasn't finished with the surprises yet. We walked onto yet another hanger where I found an Aero Vodochody L-39 C in perfect condition and I even got to sit inside this amazing machine. Then as I was about to leave Lachie came over to the car and said the Boeing Stearman will be going up very soon for a joy flight, so I hung around and watched as this beautiful ol' lady started up and taxied passed me. On my 6hour drive back to Brisbane all I could think about were the amazing aircraft I was very lucky enough to see. A special "thank you" goes to Lachie Onslow for showing me around and I am confident if you ever pass through Armidale Lachie would be very happy to show you around too... I suggest you contact him first. Below are a few of the many photos I took that morning. Along with the Northern Territory and Queensland my job also takes me South to mid New South Wales to a place called Armidale. For those international viewers Armidale is a 6 hour drive south from Brisbane and has a population of around 25,000 people. Armidale Airport (IATA: ARM, ICAO: YARM) is serviced by Qantas Link and Rex (Regional Express) and both companies have daily direct flights to Sydney only. The airport is 3,556 feet (1,084 metres) above sea level. airline for a second straight month. 15 minutes of their scheduled departure time. mainline carriers at 84.3 per cent. per cent of departures and 83.1 per cent arrivals on-time. 74.2 per cent in December, compared with 83.3 per cent in November. per cent in December, from 83.1 per cent in November. than 15 minutes late in December. on-time departure rate and 79.5 per cent on-time arrival rate. Yesterday QANTAS passengers flying from Sydney to Perth on QF581 got a pleasant surprise as their normal A330 was replaced with a Boeing 747-438ER. 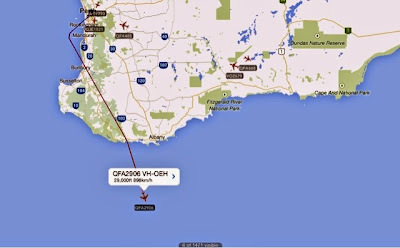 VH-OEH operated Sydney – Perth in order to be in position to operate the Antarctic Scenic Flight from Perth today. OEH was the same aircraft that did the Brisbane - Antarctica flight back on the 18th January. OEH with a call sign of QF2906 departed Perth on runway 03 just after 8am (WA time) then turned left to track back over the city before making her way south over Bunbury, passing west of Albany before heading out to sea. Thought I would take my Co-Pilot and Cabin crew (wife and children) out to the airport for a few hours this morning. 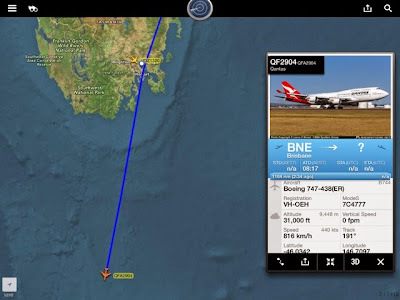 To our surprise not far from home we saw a Qantas 747 heading straight for us. So I did what any "plane crazy" person would do, I quickly pulled over and took a photo. It was only when we got to the airport I found out it was Qantas 108, This flight normally does Los Angeles to Sydney but diverted to Brisbane for medical reasons. VT-CBH MD 82 (CN 53577) SPORTING THE NAME "EMILY PALMER"
I was lucky enough to be chosen (well I actually organised it) to pick up our interstate work colleagues at the airport yesterday, so I got out there early and took a few snaps. Of course nothing but domestics came in but I did find these two sitting at the freight apron. QANTAS B737-800 Returns from Seletar Maintenance. QANTAS Boeing 737-838 VH-VXL, (CN 33482) which has been under maintenance at Seletar (in the Northeast region of Singapore) since the 6th January, positioned Seletar – Darwin – Brisbane as QF6008. The aircraft which has been repainted into QANTAS New "Roo livery" departed Darwin around 8.30pm last night (Darwin Time) and landed at 12.50am in Brisbane this morning. If you plan to travel at Easter time think twice about the airline you choose. Jetstar passengers face the prospect of disruptions to their travel plans over the busy Easter holidays after one of the unions representing the budget airline's pilots took the first step towards strike action. Following a breakdown in talks over a new pay deal, the Australian Federation of Air Pilots filed papers with Fair Work late on Friday for a ballot of its pilot members at Jetstar on whether to take protected industrial action. Last night QANTAS sent an empty Boeing 747-438ER VH-OEH up from Sydney – Brisbane as QF6101 in preparation for an Antarctic Scenic Flight today. Brisbane kicked off the annual scenic flights today, today's flight (using flight number 2904) was expected to depart at 7.30 am but left at 8.15 from runway 01. Qantas run these flights out of other cities and the departure dates are below. Qatar Airways flight QR 67 has marked the commercial debut of the Airbus A350. The aircraft (registered A7-ALA) took off from Doha Airport at 08.10 local time on Thursday, landing at Frankfurt a little under six hours later at 12.06. Qatar is the launch customer of the A350 and has 80 of the type on order. This Oneworld alliance member took delivery of the A350-900 on December 22 2014 and unveiled it to the world in front of about 500 invited guests and media at its Doha hub on January 8. Since then, the aircraft has been put through it paces with a number of training flights. Qatar also flew A7-ALA to London for noise testing in the week leading up to the inaugural flight. Qatar has fitted 36 fully flat business class seats, all with direct aisle access, as well as 247 economy seats in a 3-3-3 configuration in its A350-900. Having taken delivery of the first A350 in late 2014, Qatar was expected to pick up the next four frames to come off the Airbus production line. Finnair, which has 19 A350s on firm order, was scheduled to receive its first A350 in the second half of 2015. Skyteam carrier Vietnam Airlines was also due to receive the first its 10 A350-900s on order before the end of the year. At December 31 2014, Airbus had booked 780 firm orders for the A350 – 18 for the smaller A350-800, 595 for the A350-900 and 169 for the stretched A350-1000 – from 40 customers. I was lucky enough to be working around the airport area today so I raced over at lunch time to grab the departure of the China Airlines 747 in their "Skyteam" livery. I then returned later that afternoon to grab a few arrivals before heading home. 9V-STD A330-343 (CN 997) Singapore 265 arriving from Singapore. Travellers and holidaymakers have been left stranded after flights to and from Tonga were cancelled on Monday and again yesterday because of a huge volcanic ash cloud in the area. Air New Zealand, Fiji Airways and Virgin flights have all been affected, including one from Auckland that had to be diverted to Samoa. Tonga Airports chief executive Viliami Ma'ake said all flights to and from Australia, Fiji and New Zealand were cancelled until further notice because of the ash. The volcano is about 63km north of Nuku'alofa. An alert has been issued by the Volcanic Ash Advisory Centre in Wellington and NZ's Civil Aviation Authority is monitoring the situation. Meteorological manager Peter Lechner said: "Looking at the advisory, they've still got an ash cloud extending from the southeast. From the ocean surface, the plume is up to 30,000 feet (9,144 mts) high." Aircraft cannot fly through volcanic ash because it can severely damage the engine, erode the fuselage and windscreen and clog the fuel system. 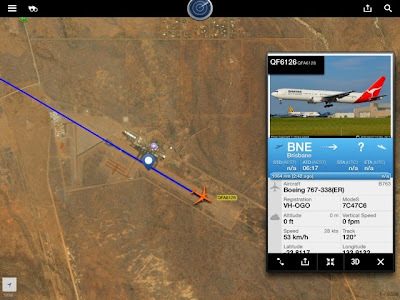 The last 767-300ER (CN 25577) in the Qantas fleet departed Brisbane this morning at 6.15am from runway 01and arrived in Alice Springs right on 9am (8.30 Alice Time) landing on runway 12. The only Qantas 767 left is OGL and that is sitting in Sydney awaiting its flight to Alice. Garuda Axe Brisbane - Bali Flights... AGAIN !! It's now official and after much speculation I can confirm Garuda have officially announced that it will pull out of its direct flights to Bali from Brisbane commencing February 1st. Just 18 months after re-launching its Brisbane to Bali direct flights in August 2013 Garuda has again scrapped the service without warning as it had done back in 2008. This afternoon Brisbane was treated to a very unusual Emirates triple play. It appears last nights Emirates flight A6-EDP (CN 077) direct to Dubai went unserviceable after arriving from Auckland. Passengers were either sent home or put up in a motel for the night. At 5.45pm tonight another Emirates A380 A6-EDM (CN 042) flying in directly from Dubai arrived to pick up the stranded passengers. Then 45 mins after that at 6.30pm the regular daily Emirates flight A6-EDO (CN 057) from Auckland arrived. It was certainly exciting to see A380's on the ground at the same time.